Looking to improve your golf game or recover from an injury naturally? We can help. For many, a relaxing game of golf is the perfect way to spend a sunny weekend with three of your best friends. But, the next day, some feel pronounced pain in the lower back. Does this popular leisure time activity produce lower back pain? According to the Professional Golfers Association, lower back pain is a frequent golfer complaint. These injuries are often the result of playing too much. Back pain affects weekend golfers too, but for the opposite reason. They don’t play often enough! Many occasional golfers lack proper swing technique. Plus, they often don’t get enough regular physical activity. They tend to swing harder and the muscles used in this type of swing tend to get stressed. An improper swing causes tension on the lower back. Investing in some golf lessons to learn proper swing mechanics could lessen this risk. Engaging in a regular walking or other aerobic activity is helpful in preventing lower back pain. In addition, older golfers (and younger ones too) need to be aware of their endurance levels when they play. 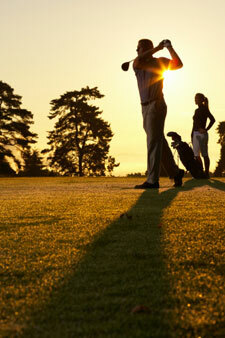 As a golfer gets tired, swing mechanics can worsen, leading to spinal stress, stiffness and increased lower back pain. It’s interesting to note that many professional golfers rely on chiropractic care. Tiger Woods, Zach Johnson, Jordan Spieth, Mike Weir, Vijay Singh and David Duvall regularly consult their chiropractor. If it works for them, it could work for you.